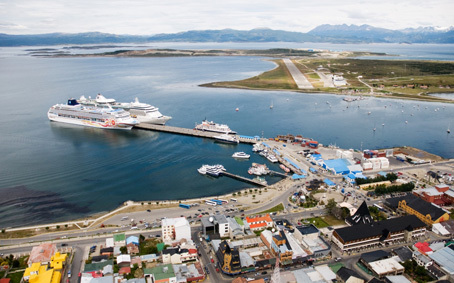 This tour departs from Touristic Pier and proposes a navigation through Ushuaia Bay and Beagle Channel to contemplate the city of Ushuaia, in one of its best postcards. This city offers a unique combination of mountains, sea and forests. Olivia and Cinco Hermanos hills, the Fique and Túnel ranches can also be observed. The navigation brings us closer to the Les Eclaireurs Lighthouse where you can see a colony of cormorants. On the way back you can photograph the Isla de los Lobos - to enjoy this attractive marine mammal, the seal - and the Despard Island, imperial cormorants’ natural habitat. During the trip we observe Magellan cormorants and the majestic imperial cormorant, albatrosses, fullman petrels, giant petrels, squas and twenty different species of sea birds. This tour shows us diverse panoramic view points through which we can get an idea of the building industry and demographic growth of our city. 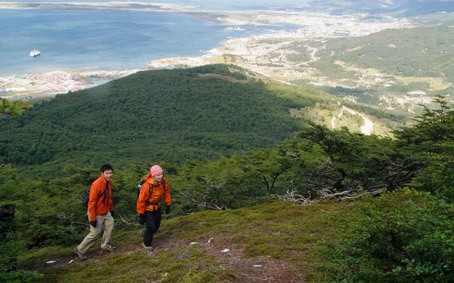 It lasts around an hour during which the guide will give us a brief explanation of Ushuaia’s background, its urban development and the changes occurred throughout times. The final stop of the tour is in front of the End of the World Museum. 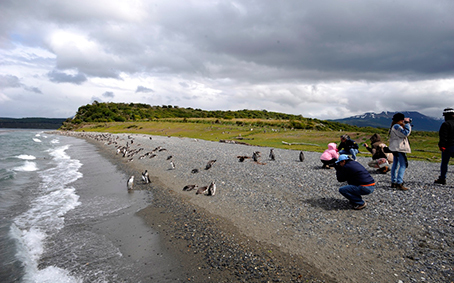 Known as the southernmost point of South America, 3.171 km separate Ushuaia from Buenos Aires. The train departs from End of the World station, by the same embankment prisoners walked 100 years ago. It goes into Cañadon del Toro, cross Pipo River over "the burned bridge" where you can see Old Wooden Bridge ruins under the new railroads. Then stops at “La Macarena Cascade" where passengers will find a reconstruction of a typical settlement of an indigenous group who inhabited these lands for hundreds of years: The Yamanas. 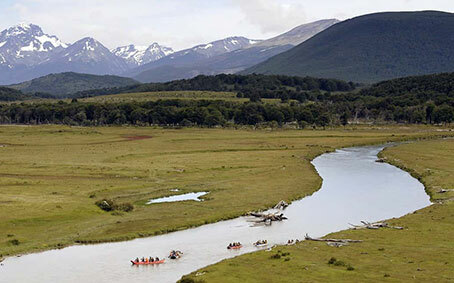 Now the train enters Tierra del Fuego National Park following the Pipo River course and continues across areas that show us traces left by prisoners in their daily routine to cut trees for nearly half a century of interrupted work. 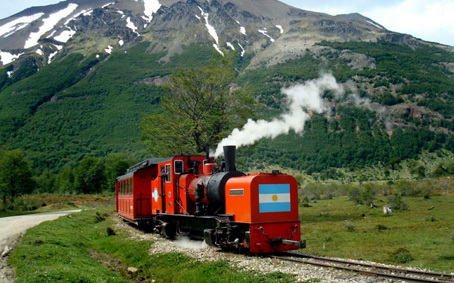 After skirting the Turbal, characteristic Tierra del Fuego soil, on which is developed a moss called Sphagnum, the train arrives at “Park Station”. Throughout the tour the visitor will be accompanied by a bilingual English-Spanish guide, explaining in detail the "prisoners Train" history. 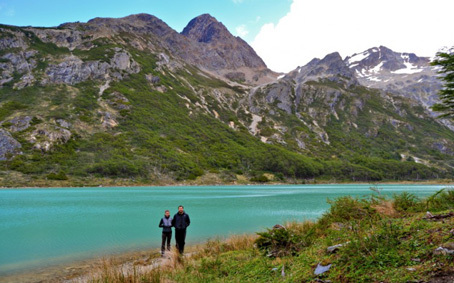 OPTIONAL TO MAKE WITH TIERRA DEL FUEGO NATIONAL PARK. Departure in the morning to northeast direction and following Route 3; after crossing the mountain range we will discover peat bogs, small glaciers, ski centers, waterfalls and dry trees, due to the presence and activity of the numerous beavers. 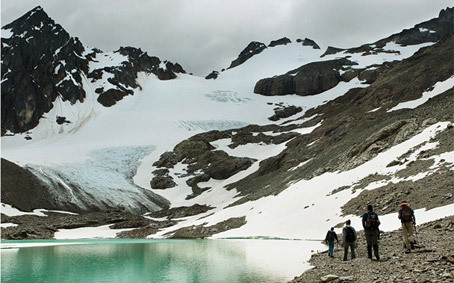 From Rancho Hambre, we will begin to ascend until reaching Garibaldi Pass following the route mountain path to a panoramic point. From there - the highest point of the province with 430 m.a.s.l. 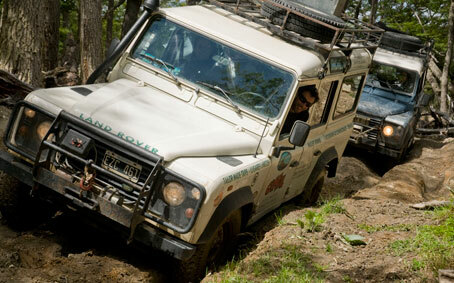 - we will have a beautiful view of both Escondido and Fagnano Lakes. 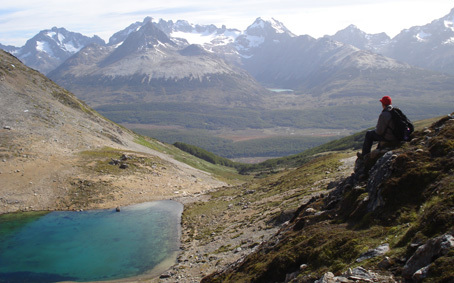 After a short rest in the viewpoint of Lago Escondido we will continue the trip passing near a sawmill to finally arrive at Lago Fagnano, the largest in the province. On the way back we will stop at a typical restaurant in a winter center to have lunch (not included). 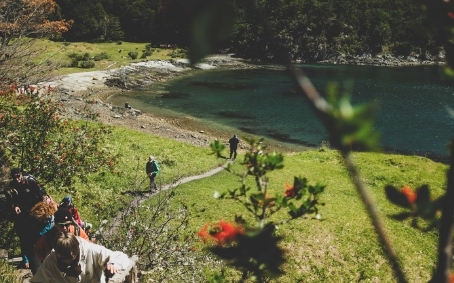 This active tour takes visitors for a ride, to navigate, to walk and to make discoveries in one of the roughest and most beautiful places in the Beagle Channel. 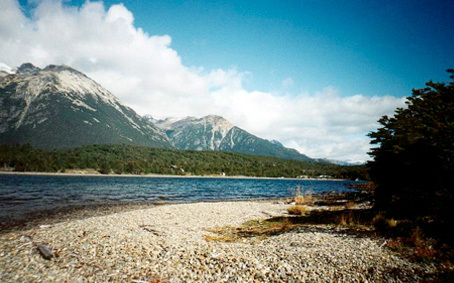 From the hotel, we leave Ushuaia Eastbound along National Route No. 3 and Route "J". 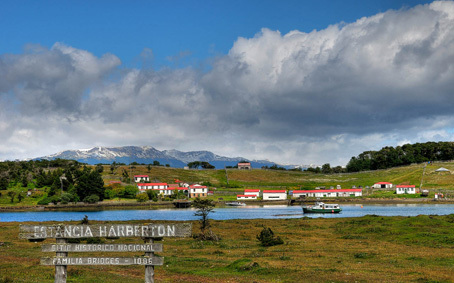 Once at Harberton Ranch we propose to visit the Marine Mammal Museum "Acatushún", and the surroundings of one of the first white men settlements in Tierra del Fuego. On board a motorboat we will leave towards Martillo Island. From the boat, we'll have the chance to see penguins in their breeding lair. 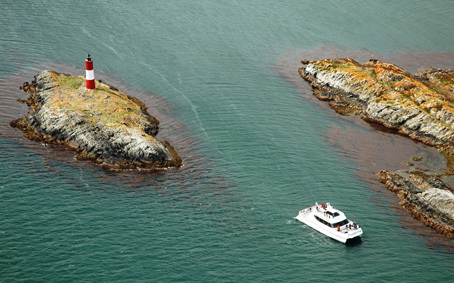 Navigation on the motorboat continues up to the main attraction of the day: the enormous Gable Island, where lunch with a good Patagonian wine, soft drink and mineral water await. 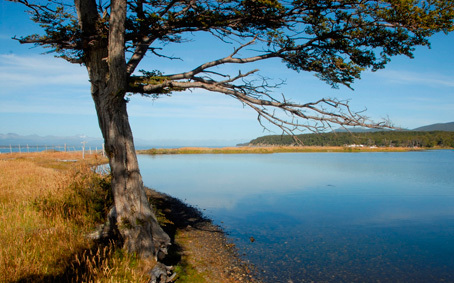 After coffee, were go for a hike to know more of this gorgeous island, crossing over beaver damms and through the forest to reach the Beagle Channel shore where we'll take the boat to reach Puerto Harberton, and to hop on the bus that will leave us back in our hotel. 8:00/8:30 Pick up from the hotel. 10:30 Arrival to Harberton Ranch. Walk around main house and Museum. 12:30 Navigation bound towards the penguin rookery at Martillo Island and Gable Island. 12:50 Penguin watching 13:10 Departure towards Gable Island. 13:30 Arrival and disembark on Gable Island. 13:45 Lunch 15:00 Hike around the Island. 17:00 Sailing back to Harberton Ranch on a motor boat and ride back to Ushuaia. 18:30 Arrival to Ushuaia. Departure from Touristic Pier sailing through the wide Ushuaia Bay until reaching the Beagle Channel, through Paso Chico. There we sail around both Birds and Seals islands (they belong to Bridges archipelago). Arriving at the Les Eclaireurs Lighthouse we can appreciate imperial and rocky cormorant’s colonies. 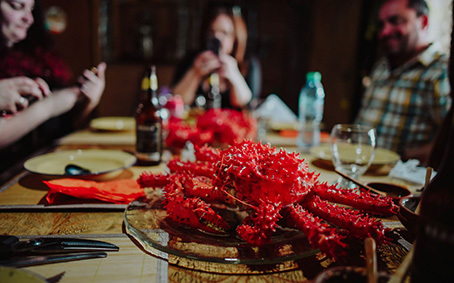 We continue sailing towards the East enjoying wonderful landscapes of the channel and mountains; at this point we will see Puerto Almanza on the Argentinean coast and Puerto Williams on the Chilean coast. 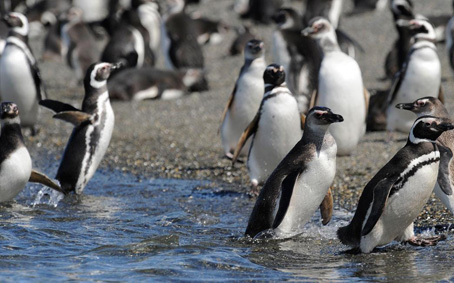 Then we will arrive at Isla Martillo where we will observe a colony of Magellanic penguins. We continue sailing to Estancia Harberton where we disembark to visit the ranch and the Acatushún Austral Marine Mammal and Bird Museum (not included). 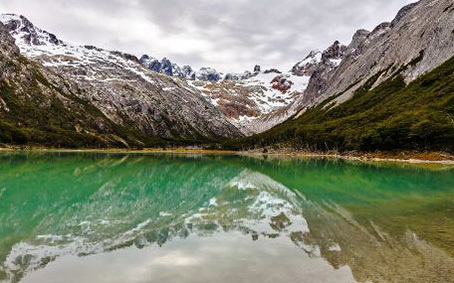 The return to the Touristic Pier in Ushuaia is a ground transfer by Complementary Route J and Route 3; a stop at the lookout point of Garibaldi Pass will allow us to observe and photograph the lakes of the area: Escondido and Fagnano. 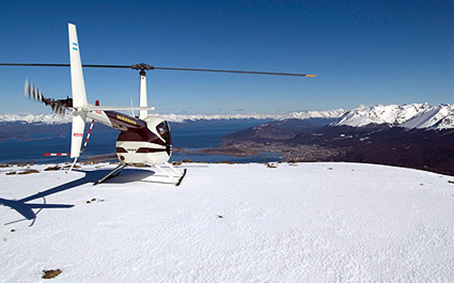 Important: navigation from the Touristic Pier located in Ushuaia to the Estancia; ground transfer to return to the same pier. 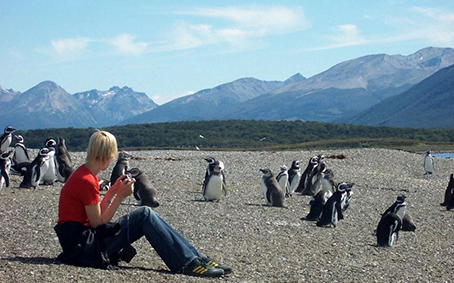 Best known as “The End of The World” Ushuaia is situated in the province of Tierra del Fuego; framed by the stunning Beagle Channel, the city is 3,260 km from Buenos Aires. Skiing in the Cerro Castor is an option to enjoy the best snow, due to the mountain orientation and extreme location. 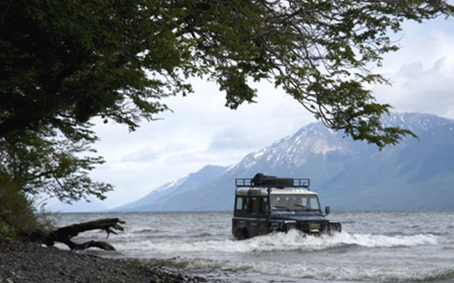 As an adventure land, there are several ways to explore its diversity: walks down the coast of the Beagle Channel among lengas and lakes surrounded by mole and condor caves; or you can travel on the antique prisoners train. 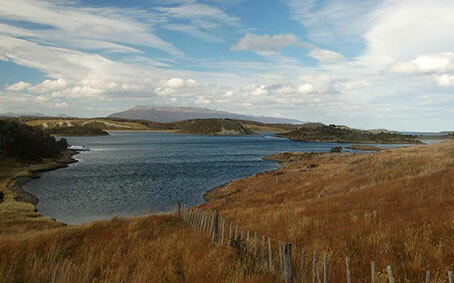 Also by kayak to the Cabo los Hornos, and even by horse looking for the old aborigine settlements. Walking, exploring, and discovering these regions will be enough to get back, live and enjoy the rhythm of the natural creation.